WTI oil holds within narrow consolidation above $68.34 low, posted after strong 2% fall previous day. Oil prices came under increased pressure after report showed global oil inventories rose to their record, which temporarily offsets positive impact from strong fall in US crude stocks previous week. Thursday’s strong fall which resulted in close below a cluster of daily MA’s (55/10/100) was negative signal, with price being pressured by widening daily cloud which twisted today. 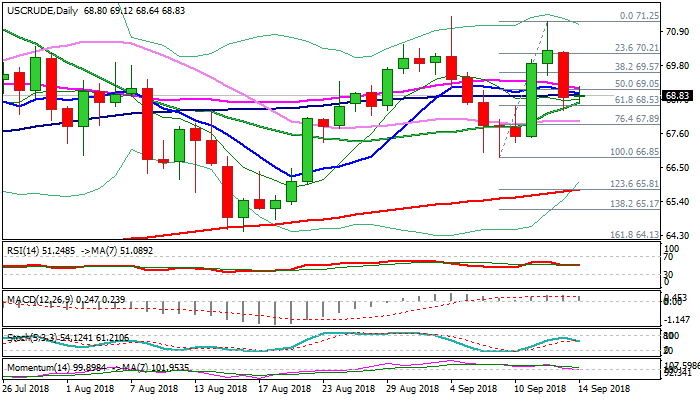 Negative momentum is building and adding to bearish outlook, which needs confirmation on close below cracked pivotal Fibo support at $68.53 (61.8% of $66.85/$71.25 upleg), reinforced by rising 20SMA. Broken daily Tenkan-sen ($69.11) caps today’s action so far and should stay intact to keep fresh bearish bias in play.